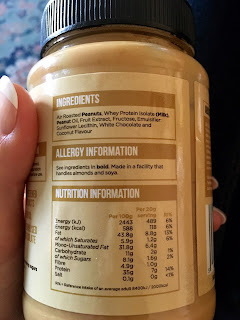 Dreaming of Footpaths: Dr Zak's: Is Salted Caramel Peanut Butter A Thing?? Dr Zak's: Is Salted Caramel Peanut Butter A Thing?? Review: I was sent the peanut butter to review. I said exactly what I thought and I wasn't paid to review it ... trust me, I'm a triathlete. Peanut butter is peanut butter. You can have it sweetened or unsweetened, crunchy or smooth. That’s pretty much it. ISn’t it? Then I was asked if I wanted to try some of the Doctor Zak’s. I wasn’t too bothered ... peanut butter is peanut butter. Apart from finding new hand-to-mouth-receptacles to put it on, there’s not much more to comment on than the crunchy/smooth, sweet/not-sweet choices. Right? I chose White Chocolate & Coconut and Salted Caramel to try. Yep. They’re that good. I like peanut butter, it makes eating a banana more interesting and I have an amazing white fish, coconut milk, peanut butter combination that I cook up regularly but it wasn’t not my go-to food after a run. But now it is. I really like this. I’m quite picky about my food but this is a product I’ll definitely be buying again. The peanut butter contains 36g of protein per 100g (tuna contains 23.5g per 100g) and uses partially-hydrolysed whey protein isolate which means your body absorbs this faster. It gives me a sweet kick after a run for relatively few calories (and low in sugar at 1.6g per serving) and it’s satisfying. This is a big thing for me as I’m more than capable of clearing the fridge after a long session ‘as a snack’ and then having a ‘proper’ meal afterwards. And it’s easy to stick on a rice cake and scoff. Simple ingredients list. Not as simple as the MyProtein peanut butter I like but all things that I’ve heard of. Free from palm oil & artificial sweeteners & Vegetarian Society approved. It’s sweetened with fruit extracts and is also low in salt. Genuinely unable to choose between the two flavours so end up with a half-and-half rice cake or two. It’s expensive at £6.99 for a 450g jar compared to off-the-shelf peanut butters, but cheap compared to a sack of protein powder. The flavours have different consistencies, one is a lot runnier than the other but this isn’t really a problem, more an observation. Make sure you stir the butter before using it as it does tend to settle. The ingredients list doesn’t give much information about the flavourings, it just says ‘White Chocolate and Coconut Flavour’. Fancy a try? Get it from Muscle Food.